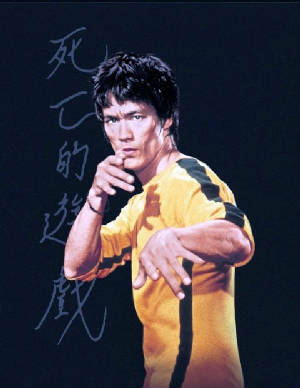 JKD’s principles offer tremendous power to one who employs them. Seemingly straightforward ideas such as simplicity, directness, effectivity, open-mindedness, non-conditionality, and fluidity are extremely powerful when implemented, both in martial arts, as well as in life. Most JKD concepts can be applied in battling an external opponent while sparring, and in battling a stronger, internal opponent: one’s mind. In blending the best of a multitude of arts and philosophies, JKD arrives at simple yet profound techniques. For example, in its “circular slope” throw, JKD employs the Aikido principle of using an opponent’s force to one’s advantage. When an opponent pushes, you merely pull and move aside; when he pulls, you push. Why unnecessarily exert large amounts of energy to resist a force when one can succeed by moving in the same direction? “Take your opponent where he wants to go:” the simplicity of this idea fascinates me. Like most JKD principles, it seems fairly obvious; yet in a heat of passion and emotional resistance, most people fail to implement it. Another powerful JKD concept derives from geometry: the shortest distance between two points is a straight line. When punching an opponent, one should directly push forward and punch him, rather than undergoing a series of unnecessary movements. In traditional Karate, one withdraws one’s arm at the waist prior to punching; in JKD, one merely punches straight. Each movement in JKD is simple, direct, and effective. Ironically, in zeal to acquire the desirable, most people travel a longer path; perhaps because we fail to understand the problem, we often circumvent the solution. In search of happiness, for instance, people continually set themselves material milestones such as acquiring a particular car, toy, or bank balance before allowing themselves to enjoy that which they already have, or spend time with friends and family. During this course, I have questioned such postponement of happiness, and begun observing the roots of my actions rather than mechanically functioning on the basis of what others do. Interestingly, JKD also advocates gaining a full understanding of an obstacle; once the situation has been understood, a solution will emerge from the problem itself. In the circular slope, for example, once the direction of an opponent’s force has been recognized, the solution lies in moving the opponent in that direction. In daily life too, I have found this principle to be true; with a stable, open, and resistance-free mind, one can find solutions closely packaged in problems. A closed, conditioned mind however, tends to revert to tried, longer paths that may or may not deem effective. For example, in the heat of an argument, instead of getting carried away and reacting instinctually, if one merely understands the cause of the other party’s anger, it is possible to channel the energy to reach an understanding. JKD sets itself apart from other martial arts in allowing its students to adapt its philosophies and principles to their own body and personality type and “find their own JKD.” Both physically and mentally, students begin understanding their strengths and weaknesses, and with practice in the art, learn to play upon their fortes and work on limitations. JKD inspired me to challenge my mind when it constrained me from moving further. JKD has given me further physical and mental confidence to face the unknown. Prior to this course, I feared the dark and found myself unable to stay alone in a dimly-lit environment. Moreover, situations such as being in a closed elevator alone or closing the door of a room at night daunted me. Although my fears have not vanished, I find myself more assertively fighting them. JKD has given me a sense of self-assurance that allows me to test my limits by sitting in a dark room alone or petting a dog I find scary; once I have done this, the same situation seems far less daunting the next time I am placed in it. I have found that the mind can offer immensely convoluted yet convincing reasons not to do something: for example, I could not sit in a dark room alone lest a supernatural power attack me; in daylight, however, it somehow would not. Whilst JKD does not rid me of this unreasonable fear, it does equip me with tools to question and battle my mind. The Zen concept of “no mind” that JKD has adapted empowers me to move between a thought and an action fast enough that I have acted before my doubts and suspicions arrive. For example, if I go and sit in a dark room before my mind tells me I cannot do so for xyz reasons, I realize that I am already in a dark room, and really, nothing is attacking me. Physically, this concept allowed me to expand my limitations while working out. If I believe I can only do 10 pushups, I will not be able to convince myself otherwise, and my body will unwittingly cooperate with my mental limitations. If I am already in the midst of the next push up before my mind can say “I can’t,” I am able to accomplish far more than I thought I could. I have found while learning JKD that one should either act or not act. When one engages in the tedious process of deciding whether to act, however, thoughts themselves occupy so much time and energy that by the time a decision has been made, either the time to act has lapsed, or one is too exhausted from thinking to act. This especially applies while sparring, as one has limited time to take advantage of an opponent’s blunder before he/she corrects him/herself. Each of these concepts grows along with a student, and I hope to understand and implement them more effectively with time. I expect that practice of both the martial art and the philosophy will lead me to interesting places, and I look forward to it.